Leftover scrapbooking supplies are great for making cards. This article shows how to turn your scraps of floral papers into three gorgeous cards for some special ladies in your life. These cards were created using Bazzil Christmas Cards (you could make your own cards out of red and green Bazzil cardstock), leftover pieces of Chatterbox papers (Scarlet Rec Daisy paper, Powder Bubbles paper, Rec Sandbox Flowers paper, Rosey Nook Blossoms paper, Nook Light Blossom paper, Mini Powder Puffs paper and Powder Puffs paper) and alphabet stickers. To create the first card, adhere a rectangle of Chatterbox Scarlet Rec Daisy paper to the front of a red card. Cut two strips approximately 1cm wide from the underside of the Chatterbox Powder Bubbles paper. Place one strip vertically down the middle of the card and the other horizontally across the middle. Cut out a red flowers from Chatterbox Rec Sandbox Flowers paper and adhere to the centre of your card. You now have a gorgeous card that resembles a wrapped up gift. To create the second card, adhere a strip of Chatterbox Rosey Nook Blossoms paper approximately 1cm high across the top of a green card. Adhere a second strip approximately 2cm high across the bottom. 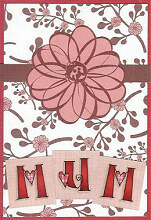 Cut out a large and two medium flowers from Chatterbox Nook Light Blossom paper and position in the middle of the card as shown. 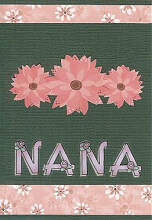 Finish off by using alphabet stickers to write a name or message under the flowers. To create the third card, adhere a rectangle of Chatterbox Mini Powder Puffs paper to the front of a red card. Cut a strip approximately 1cm thick from the underside of the Chatterbox Mini Powder Puffs paper and adhere across the card towards the top. Cut out a large flower from Chatterbox Powder Puffs paper and adhere in the centre of your strip. Cut three squares from the underside of Chatterbox Powder Bubbles paper and position across the bottom of the card, as shown. Finish off by using alphabet stickers to write a name or message in these squares. Card making really is a great way to use up all those leftover bits and bobs from your scrapbooking projects. Why not haul out your stash of scraps and see what you can come up with!